“Both sides” aren’t to blame in the Israeli-Palestinian conflict. Israel is. 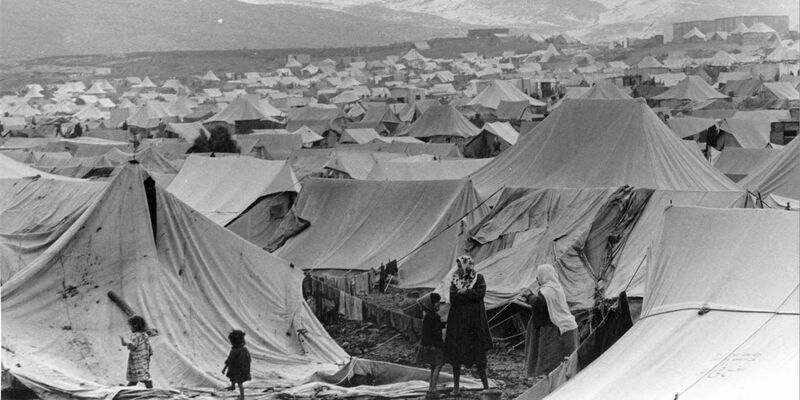 An early refugee camp. Late 1940s, Palestine. On July 15, Western media demanded that Hamas and other resistance groups operating in the Gaza Strip accept what they labeled an “Israeli-Egyptian ceasefire proposal.” On the surface, the call sounds reasonable, which is exactly what allows it to disorient audiences largely unfamiliar with the details of the ongoing conflict. The first objection is the obvious one: How can Hamas agree to a deal that it played no part in negotiating and that was crafted by two of its enemies? The mainstream media would be unlikely to demand that Israel agree to an arrangement jointly put forth by, say, Hamas and Iran — an imperfect analogy, since Hamas and Iran do not colonize and besiege Israelis. But the point stands. Second, implicit in this criticism of Hamas is the idea that Palestinians are obliged to accept any offer, no matter its terms. Consider, for instance, Mouin Rabbani’s point that what the Gaza Strip’s militant groups and a huge number of Palestinians object to in the proposal is that it just puts back in place the same 2012 ceasefire agreement which Israel has violated freely, and does not ensure that such violations would stop. The Israeli violations of the 2012 agreement that Rabbani mentions are a long-term habit of the country. Hamas has good reason to distrust Israel’s commitment to a ceasefire, but Western media has tended to ignore this point when it discusses the failure of the proposed truce. Also overlooked is that a ceasefire which does not lead to lifting the siege is no ceasefire at all. For the siege and the naval blockade on which it relies are acts of war. An agreement that only ends one aspect of the violence and not the others is not a ceasefire but a surrender. Israeli tactics for dealing with Hamas are ransom, not negotiation. In that vein, Netanhayu also reportedly “suggested that the agreement would be used to completely ‘disarm’ the strip, a condition Hamas and other groups would not accept.” Such a proposal cannot be taken seriously unless Israel were to also agree to disarm, which is clearly not on the table. The Western ruling class and Israel would react with laughter rather than rage if Hamas proposed that Israel surrender its weaponry. If Israel was sincerely interested in a ceasefire, it would offer terms that there is a chance of Hamas accepting. Such accounts also play on racist notions of Arabs as creatures who prefer violence to the alternatives available to them. The trope is clear: the atavistic colonized subjects who will consent to their own people’s destruction rather than have a dialogue with their oppressors. The latter’s alleged preference for dialogue over bloodshed is proof of their civility, and so also justification for their rule. This colonial inversion of reality is likewise present in Western reporting on the conflict, which must justify the Israeli assault on Palestine to its audience. For example, earlier in the current massacre we were frequently told that “both sides” fighting in historic Palestine are suffering and are in the wrong. This rhetoric of “both sides” implies that pain and fault belong equally to Palestinians and Israelis. It erases manifold, unmistakable, qualitative and quantitative differences at play in Israel’s attack on the Gaza Strip and the political-historical context in which this is taking place — most centrally, that what is occurring is part of a settler-colonial invasion. “Both sides” rhetoric refuses to make even the easiest, most obvious judgment, to which any honest evaluation of the information points: that Israel is massacring Palestinian adults and children, 77% of whom are civilians, and subjecting them to collective punishment; that Israel evidently claims for itself a right to extra-judicially execute anyone who it says is a Hamas member, a practice too few among even Palestine’s allies have denounced; that Israel is bombarding what is essentially a giant refugee camp home to an imprisoned population of a people Israel has ethnically cleansed, occupied, subjected to apartheid, and repeatedly slaughtered; that international law does not grant Israel a “right to defend itself” against the Gaza Strip. And that international law does grant Palestinians a right to resist using armed struggle. To employ “both sides” rhetoric completely misrepresents the situation. It is not “both sides” who take thousands of political prisoners. Both sides do not systematically torture each other. Both sides do not control each other’s freedom of movement, or access to the sea, drinking water, and education. Only one side killed four children who were playing on a beach on July 16. At the time of writing, only one side has inflicted on the other the destruction or severe damage of 1,660 homes or the deprival of 900,000 people of water supply. Nor do Israelis and Palestinians bear comparable responsibility for the forty-seven United Nations Relief and Works Agency premises such as schools and clinics that have been damaged since July 7. What is even more important about the “both sides” notion is what it conceals. Nor in this telling was the starting point June 10, when Israel attacked a man alleged to be a militant and the ten-year-old he was with, instantly killing the man and causing the child to die from injuries three days later. That’s to say nothing of the accurate starting points: the 1947–8 Nakba, the 1917 Balfour Declaration, or May 2, 1860, the date of Theodor Herzl’s birth. In addition to these distinctions, the “both sides” idea is dangerous because it is immobilizing. With its use, it becomes impossible to demand an end to colonial practices. And that is exactly the point.